It’s said that, after Mickey Mouse, Charlie Chaplin‘s tramp is the world’s most recognisable character…… ever. I think it’s true; the little black and white figure with bowler hat, tiny moustache, tail coat and cane is everywhere in Asia and Africa. I guess this is because his fame came from the era of silent film; language wasn’t necessary to generate wide appeal. Chaplin was barred from America in 1951 because the FBI believed he was communist. 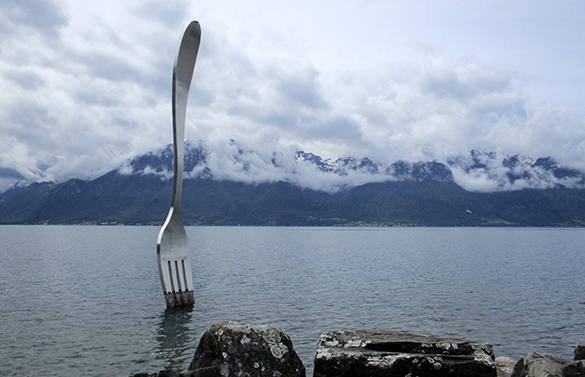 Vevey in Switzerland became domicile for him and his family. If you know where to look, you can even find his grave. 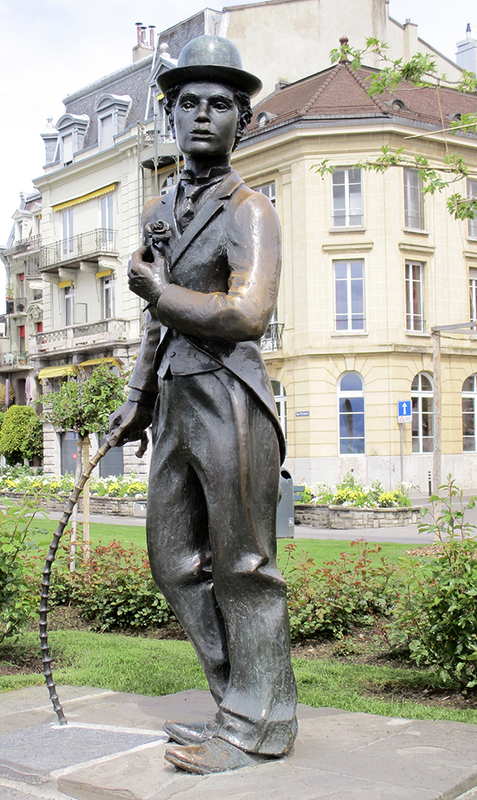 It is something of a paradox that a statue in the memory of someone who identified with and highlighted the plight of the poor and oppressed can be found on the shores of Lac Leman in Vevey, Switzerland; just about the wealthiest little town in Europe. This is a much loved statue. The shabby-comic-sad air is captured. If it moved, there is no doubt the walk would be immediately recognisable. Note the left arm and shoulder burnished by thousands of hands; everyone wants their photo taken arm-in-arm with “Charlo.” Holding the flower-girl’s rose to his heart, he looks out onto the calm waters of the lake. Something seems to have caught his eye. Maybe he is reflecting on why Vevey is so wealthy?